This user is a participant in the Motivation and emotion unit, 2010. This page is an e-portfolio. Also see other participants' pages. I am currently studying a Bachelor of Human Nutrition and doing Psychology as a minor. This semester i am enrolled in Motivation and Emotion with James Neill. I chose this unit to learn about what drives someone and learn how i can motivate myself to study rather then procrastinate. I am also interested in Motivation and Psychological disorders, focusing on anxiety and the connections between motivation, emotion and eating. This week we were introduced to motivation and the history of motivation. Why does behaviour vary in its intensity? After the introduction James went on to teach us about the history of Motivation. Another Student created a great timeline on the topic. We also had our first tutorial,which began by mixing with our peers by forming small groups with people who shared similar feelings and traits. We then were asked to define motivation and emotion and discovered that there are many different meanings for these two words. After sharing our definitions the following is what i think these two words mean. Motivation-The driving force behind any behaviour. Emotion-State of mind which is determined by thoughts and feelings. 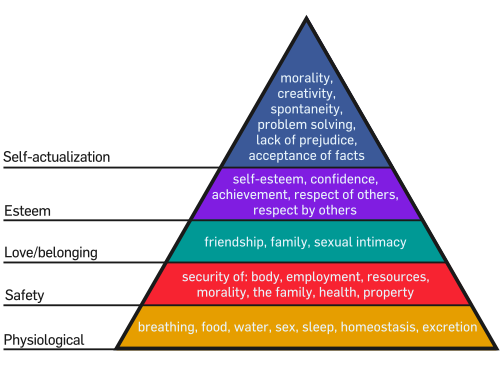 Needs- any condition within an organism that is essential and neccessary for life, growth and well-being. Autonomy- perceived control of choices, which requires support. These two aspects are gained through tasks that are challenging enough to interest the person without being too hard and causing stress, thus, overwhelming them. I think i am a Low-need achiever because i tend to procrastinate and struggle to motivate myself to put large amounts of effort in. Both examples show quasi needs do not fit into the defintion of a need; any condition within an organism that is essential and neccessary for life, growth and well-being. One could argue in today's society that Money is a need rather then a quasi need as it is neccessary to buy food or to buy land and seeds to grow food, therefore it is essential and necessary for life, growth and well-being. We also had our second tutorial. We began discussing with our small groups our progress on our Textbook Chapter and then moved onto talk about parts of the brain involved in Motivation and Emotion. Each structure within the brain has a motivational or emotional experience. We also very briefly touched on Physiological needs, Psychological needs and Social needs. After this we completed a questionaire about Autonomy, Control and Impersonal traits, to see where we fit. My scores were very similar for each but my highest score was for Autonomy followed by Impersonal and then Control. Empowerment-Possessing the knowledge, skills & beliefs that allow people to exert control over their lives. Mastery Beliefs-Extent of perceived control one has over attaining desirable outcomes & preventing aversive ones. Learned helplessness-State that results when an individual expects that life's outcomes are uncontrollable. It can result in depression, low self efficacy, motivational, learning and emotional deficits. People in some society's tend to fear being different, but in today's society we see more and more people stepping up and showing that they are unique. Possibly celebrities such as Ellen DeGeneres could be an Idol for others who were struggling to show their true identity and she has given them the confidence to do so. In recent years we have seen the rise of EMO's. I think emo's could be hiding their identity and trying to be substantially different from others. In the Tutorial we looked at Intrinsic & Extrinsic motivation for being a university student like, Career, Education and Social opportunities. We completed a University Student Motivation Survey. The average, highest motivator for studying at univeristy is to attain a career. This is followed by learning, socila opportunities, altruism and pressure. After this we looked at learned optimism and discovered too much optimism can be negative. In the case for gamblers, they will continue to gamble as they believe they will win, thus a little pessimism is a positive thing. We completed a survey from THE QUEST which evaluated our pessimism and optimism levels. The last activity for this tutorial was on Self. We looked at defintions of Life effectiveness and completed another survey L.E.Q. to see how we think and feel about ourselves. Emotion can motivate someone to take action. It can also be representative of how well someone is adapting. Emotion is Caused by a significant event which is followed by cognitive and biological processes. Basic emotions differ from one perspective to another. Emotions are beneficial to learn how to cope, for social interactions and regulate behaviour by contributing to cognition. Some emotions are an adaptive response. Emotions can be considered negative or positive. This varies across cultures, for example interpretation of love can be different for different cultures. When James first mentioned that for parts of China people consider true love a negative emotion i was shocked but as he continued to explain that this is because of arranged marriages i understood that if one were to find true love outside of their marriage it would become a very negative experience. Personality Traits affect one's reactions to situations, whether they avoid, approach, or modify. Arousal is a continual state, the inverted u shows how arousal level relates to performance. Underarousal results in boredom which is avoided by many people. When someone begins to become underaroused they usual seek tasks that interest them to increase arousal. Overarousal can cause stress. A situation where someone encounters a bear for most people would not be an ideal situation thus causing overarousal resulting in stress. The brain requires stimulation but over stimulation results in stress. Sensation Seeking- personality characteristic of one who seeks intense experience and stimulation to maintain a good mood. Eg Ben Cousins Sensation seeking trait can be a predictor of addictions such as gambling or alcohol addict. Growth Motivation and Positive psychology is said to be overly optimistic, naive, vague and ill-defined. The Question this week is how do we know what is wanted or what is really needed by the actualising tendency? Situationally position yourself for peak experiences, choose environments of preference. Rodgers beleived an organism has one basic motivation-self actualisation. It is innate and continual, genetic potential, personal development, conditional or unconditional regard, social environment organismic valuation process, evaluating whether something is damaging or developmental. Autonmy- individual sees themselves as fundamentally in control, they make decisions based on needs and interests. It is possible that Fred Hollows could be seen as having an Autonmy casuality orientation. The Problem of Evil-intentional acts of harm Some people can get pleasure for others suffering. A child solider has been brought up to be violent he/she knows no different. Eudaimonic well-being-actively persuing self actualisation, richer, deeper, authentic happiness then hedonistic. Motivation and Emotion was an enjoyable and interesting unit. I am unsure how i feel about the e-journal as i have conflicting thoughts. I feel it is a good method of getting students involved in tutorials and lectures and i agree with User:E.herbert that it is a fantastic learning tool if it is completed weekly. However the weekly writing proved difficult as i found myself completing other assesments and had another unit which also had weekly assesment items only these had deadlines. I find my motivation comes from a deadline and knowing it has to be completed now and not after that time. Having weekly deadlines may also make it easier for the marker. Thankyou James. This page was last edited on 9 January 2015, at 02:09.